SKK Versan took out 1st place in the Baltic Cup in the W35 age group, blowing away Kekava 67:40. Ligita Kinkeviciene was again outstanding for the Lithuanians with 29 points and 6 rebounds while Sigita Nevarauskaite contribute 15 points in the win. Dace Cinite did her best for Kekava with 13 points and 6 rebounds for the Latvians. BC Svaja was had too many answers against Jelgavas Novads in the W35 age group storming to a win and first place in the Cup, 38:24. 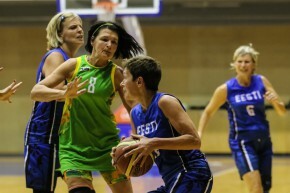 Ingrida Jonkute provided 12 points for the winners while Jolanta Jurciuviene took 11 rebounds for the winners. Ineta Krumina put in the effort with 6 points and 9 rebounds for the Latvians while Una Epnere added 6 points as well. In the tightest game of the afternoon, Tukums pulled out a 1-point victory over the shorter but nimble Tark ei torma team to take first place in the W50 age category. The Estonians’ quick ball movement wasn’t enough to take the game. Zane Rozite topped the scoring once again with 14 points and 7 rebounds, while Dace Zeltina had 9 points for the Latvians. Ulle Jarv scored 12 points and collected 7 rebounds and Katrin Aava had 12 points and 5 boards for the losers. Rigas Satiksme took Estonia by storm winning by 40 points, 77:37 to take out 1st place in the W40 age group. Ilze Dukate was unstoppable, scoring more than the Estonian team combined, notching up 49 points and 12 rebounds for the Latvians. Ilze Ose Hlebovicka pitched in with 10 points and 10 assists for the winners. Katrin Olmari finished with 13 points for Estonia.